Access to the internet over the abundance of mobile devices is so commonplace and expected, it’s often assumed to be available wherever people may be. But cost limits the availability of hotspots, and they are bogged down by overuse. NPI’s innovative solutions can expand the same level of access as the wireless LAN in a home or a hotspot to virtually anywhere! There’s no waiting to find a hotspot, since access will already be there. Our patented solution uses “cells” of wireless access repeaters deployed in the streets, ensuring that a hotspot is no more than a median away. Even people walking near the street or shopping in stores without wireless Internet will have access. And the advantage – it doesn’t use the capacity- strapped cellular network but rather the bandwidth-rich backhaul network. Without any change to subscriber accounts, providers will deliver a higher level of service, creating a new business model that includes universal availability of access. Licensed access for carriers and providers to create close-to-the-user UDNs and other wireless infrastructure within NPI’s patented coverage geographies. 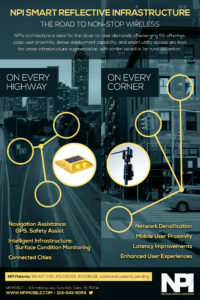 Besides improving experience and connectivity for today’s devices, NPI-powered wireless accommodates the addition of future technologies and verticals. Non-intelligent repeaters: users communicate to these units which hand off the signal to accommodate a mobile user. The distance between repeaters and the number of repeaters within a “cell” will be dependent on the technology used. Intelligent repeaters: non-intelligent repeaters communicate to an intelligent repeater, which acts as the primary source of intelligent management for mobile users as well as the connection to the Internet. Controllers: residing off the street, the controller communicates wirelessly to the intelligent repeater and is hardwired to the backhaul network to provide Internet/network access. The patented technology is designed to withstand the rigors of street traffic. The footprint of the components allows them to be deployed not only on the street but also in common walkway areas – maintaining the aesthetic nature of the surroundings while still providing the access desired.